This historic building is said to have been one of the original farmhouses in the area. Nonetheless, it has withstood the ravages of time better than many newer ones, and we've kept it in good condition and made many upgrades to it. The building is built on a rock foundation with oversized timbers (they don't make 'em that way anymore), and is very warm in winter thanks to a powerful steam boiler in the basement. Many years ago, before Laramie's Ivinson Memorial Hospital was established, a doctor bought the house, added three bedrooms, and turned it into a hospice for his patients. Today, it's divided into four separate apartments -- three 1-bedroom units and one 3-bedroom unit. All have separate entrances, and the sound insulation between them is quite good. (See the descriptions of the individual units for inside views of each.) We've maintained and improved the property for several years, adding a lot of amenities. This view shows the front of the house. It's located in a quiet residential neighborhood 3 blocks from the University of Wyoming Classroom Building and 2 blocks from Gateway Plaza, which contains Safeway, Hastings Music and Video, KMart, and several other stores. It's also within a few blocks of several good restaurants and 2 blocks from a large laundromat. 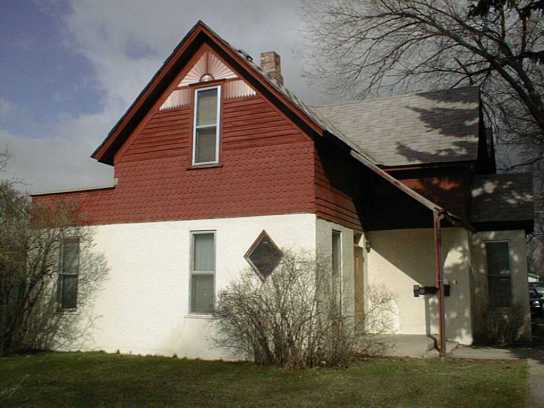 This is an ideal location for UW students, faculty, or staff; however, anyone who lives and/or works in Laramie will find this property an attractive and convenient place to live. We care about accessibility! This page has been approved by Version 3.1 of Bobby, a web-based tool that evaluates the accessibility of Web pages to people with disabilities.